When does the pick get implemented? I will be sad. This could be the last time we see Howard - Ashland/63 service ever. Something doesn't seem right. 10 night cars get consolidated into just 4-5??? The trains run every 15 minutes between 1 and 4 am. Owl service is SCHEDULED to run every 15 minutes, delays and abnormalities notwithstanding. 939 is the last night car out of 95th now and 940 is an extra. Red Line service between Howard and Ashland/63rd will no longer operate during the morning or evening rush periods. Red Line service will run between Howard and 95th at all times. 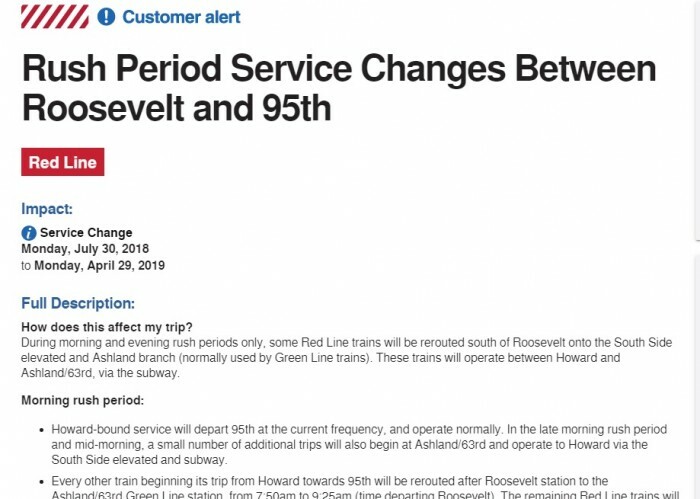 The Howard-Ashland/63rd Red Line trips are being discontinued due to the substantial completion of construction for the 95th Street Terminal Improvement Project.